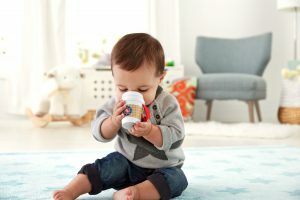 We expect retailers will be excited to learn about the new Spring Fisher-Price lines that have been added to our wholesale range exclusively for trade supply. 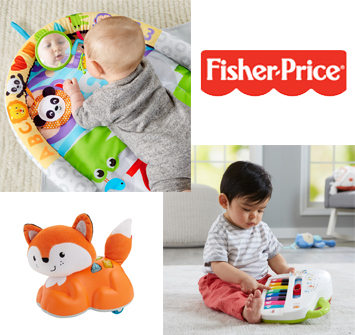 As a nominated and experienced wholesaler of Fisher-Price goods for over 9 years to independent retailers, customers can expect a comprehensive selection of their best-selling products. 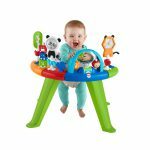 Entertainers have always been a flagship category at Fisher-Price since their launch of the evergreen Rainforest Jumperoo. Since then refreshes and additional styles have been added, including the space saver and sit to stand that can be converted to a play table once toddler is able to stand. This season the brand has gone a step further and launched the Fisher-Price 3 in 1 Spin Activity Centre in bright and neutral colours. The item goes from an entertainer, to floor activity centre to toddler play table, providing great value for money through its longevity of use and reasonable SRP of £69.99. Within the baby range, the Sit Me Up Floor Seats are another trusted product by Fisher-Price and for Spring 2019, they have introduced the ‘Windmill’, a pretty neutral printed fabric that keeps baby secure and in an upright position and also includes 2 toys for motor skill development and interest. The item also folds flat so ideal for storage and space saving when not in use. Potties are another core area, with the My Potty Friend staying consistently in the range for many years with its encouraging phrases, songs and real toilet sounds. There has also always been a basic potty in the range which is periodically refreshed, and this season is styled with a unicorn print! 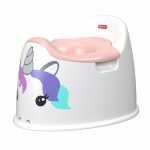 The pretty design will surely encourage little ones to sit on it, and with the removable pink bucket makes cleaning up easier for parents. Finally within the core baby products range, the Fisher-Price gyms continue to take a key share of the market with fresh designs, competitive prices and multiple features. An additional niche has been incorporated into its latest addition in the 2 in 1 Flip & Fun Activity Gym, which is its high contrast black and white print on one side for stimulation during the earliest days. It also has adjustable arches for a change in view as well as encouraging tummy time. It comes with 3 removable toys including a baby safe discovery mirror too. The Laugh n Learn range has grown in popularity in recent years with the introduction of Smart Stages technology, that allows parents to set the level of learning content through 3 stages as per their child’s development adding to product value for money. For spring there is a new piano, refreshed in beautiful bright colours and features real piano notes, as well as animal sounds, colours, numbers and shapes. It has a carry handle too so easy to take along. The popular tool bench is also back, refreshed in new seasonal colours alongside the friendly puppy and teaches all you would expect and in addition opposites and French! It is also bursting with motor skill development opportunities too with nuts and bolts to bat at and shapes to sort as well as a bead bar. 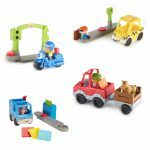 The Fisher-Price Little People range has had significant investment over the last 2 years to promote it for role play value, community interaction and motor skill development. The toy playset range has increased to include a farm, home and popular Turns Skyway, as well lower price point toys including a school bus and figures. Newly added to the range is an assortment of vehicle playsets with driver and accessories and also a refresh of the Wheelies Garage. 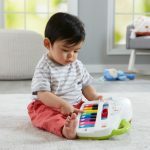 Within the Fisher-Price toy range there is lots to choose from to create your ideal retail package including a selection of price points and entry level products from teethers to dancing toys. 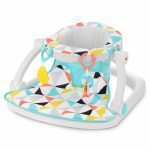 There’s colourful ‘twist n turn’ rattles in an assort of colours each featuring a recognisable Fisher-Price character, an teether styled like a coffee cup (for those little ones who must have what their parents have!) and roller toys that encourage little ones to roll them along as they crawl and explore their clicks, sounds and knotted tails. A classic toy line has also been re-launched at Baby Brands Direct which is the Fisher-Price Baby’s First Blocks! It’s a simple shape sorter with 10 colourful blocks with carry handle bucket for take along fun. There’s also the option of the Sort and Spill Learning Truck, which has 50+ songs, phrases and even lights to go along with its shape sorting feature. 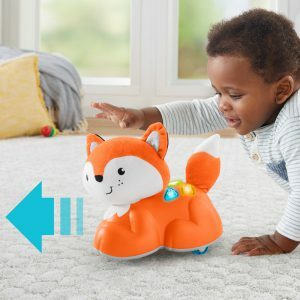 A hero product just launched is the Fisher-Price Sit to Crawl Learning Fox, this is designed to encourage crawling and movement and uniquely offers 360 degrees of turning, compatibility with multiple surfaces, 45+ songs and sounds and a plush head with crinkly tail that makes it all the more lovable. A updated take on the basic but evergreen Rock a Stack is the Fisher-Price Spinning Stackers! More that grasping and stacking, it also spins, adding to fine skill development and fun. There’s also the stack and slide magic mountain which has 2 ways to play – stack and build or drop and slide! With the latter the rattle bear shots through the mountain for fun sounds and music! The Fisher-Price Dance & Groove Rockit, is a toy character (Rockit) that comes with its own pet friend (Glow) that interact together, teaching cause and effect. The duo also offer lights, music, and phrases while helping to teach the alphabet and more. It can also record phrases spoken to it for a personal touch, SRP £39.99. The Beats range is all about inspiring little ones to get moving and dancing through its musical toys. 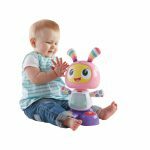 The popular Dance and Move Beatbo is now joined by Beat Belle (same product in the pink version). There is also a new Bright Beats Tumble Ball Assortment that encourages little ones to chase after the colourful lights, fun music and phrases as the balls are rolled! A nursery item we are often requested supply of are tummy time supports. Hence, we anticipate the neutral coloured, sweet panda design Hug and Play Tummy Wedge to be popular. 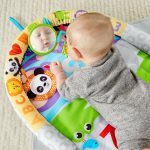 As well as providing tummy time functionality it also has a crinkle face, satiny ears and three linkable activity toys including a self-discovery mirror. With lots of choice from leading brands in the baby and nursery industry, retailers can access supply of all they need to build a comprehensive in store toy selection. Baby Brands Direct offers trade prices (same as buying direct from the manufacturers) and has further price incentives including volume discounts, special offers and loyalty credit. Log in now or register for an account to view prices and place orders. MAM – 10% Off Trade Price Now!